How do you pack a lot of home into 318 square feet? Sometimes the answer is deceptively simple. 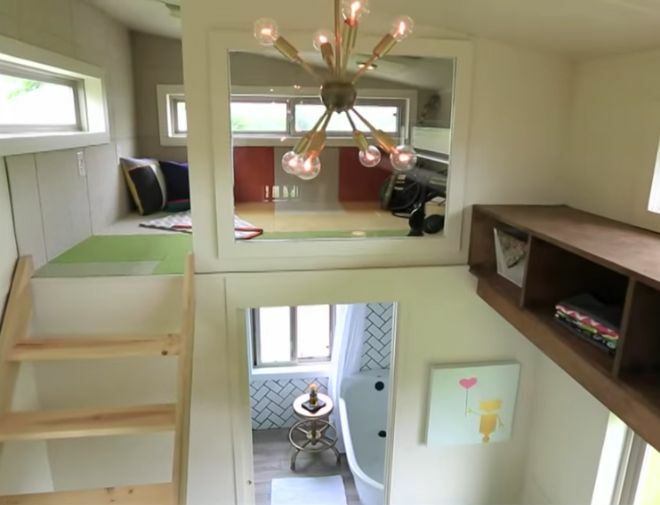 The house was made for Angela and Hydrect on the fourth episode of Tiny House Nation first season. 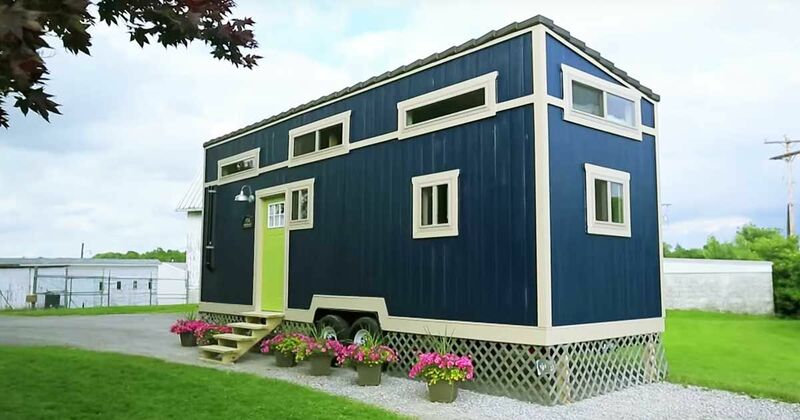 Extra space was found in this trailer home by simply extending the roof higher all around, but with added height in the front, which gives the roof an angle that makes it easier to shed snow and rain. (This is Wisconsin, after all.) That created room for not one, but two generously size lofts. The first, the master bedroom, is large enough for a king-sized mattress, which leaves lots of room for sitting up in bed. 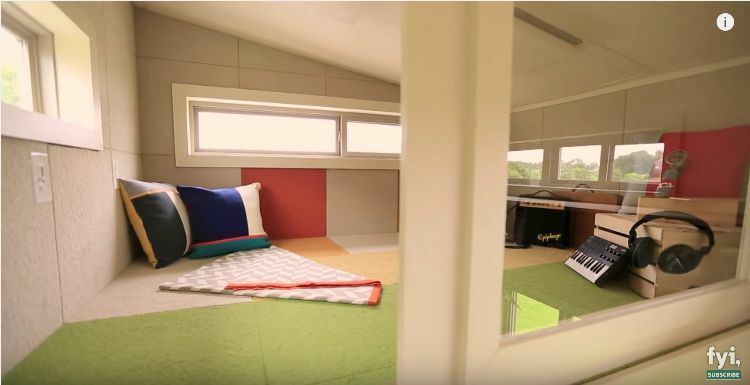 The second loft is an insulated music room with a glass wall to help trap the sound and a rubberized floor and walls to mute the noise from the rest of the house. 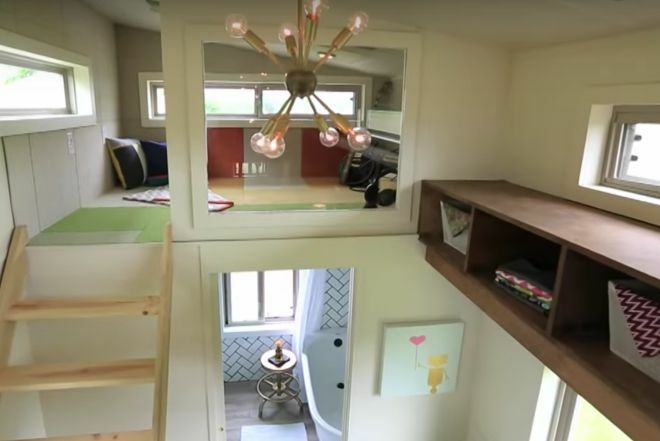 Let's take a look and see what we see in this simple, modest, but joyfully spacious tiny house. So much to take in all at once, the photo does not impart the idea that this is a tiny house at all. The kitchen in the back of the trailer is an efficiency kitchen, but it has plenty of space for a master cook hard at work. The loft bedroom above seems both roomy and private with help from the blue partial wall. There's also plenty of light streaming in from all sides, which helps beat the small-house blues. There's also plenty of cubicle space along the top of the left-hand wall. The counter in the middle to lower left side of the photo is multi-purpose -- part workspace, part dining room, part storage cabinet. Here's a close-up of that great kitchen. This baby has tons of cabinet space and lots of counters for preparing a memorable repast. A quick shot of the master bedroom. There's even enough room for some storage behind the bed. The second loft was originally made out by Tiny House Nation to be a music studio. The wall on the right is actually a glass panel that allows you to view the rest of the house. The floor, although hard to see in this photo, is rubberized flooring that serves to keep the sound contained. The wall tiling is also designed to keep the acoustics within. Looking through the glass panel in the music studio loft, you can see the cubicles that line the wall. Although they cubicles are up high and out of the way, the ladder for the lofts is movable, so you can make your way around the high spots in the room to retrieve or stow away items. The bathroom has a delightful tub for easing away your worries and salving the troubles of the day. But the standout in this bathroom maybe that great wall pattern, which is novel, but calming in its way. Take a YouTube tour of this gem if you like. 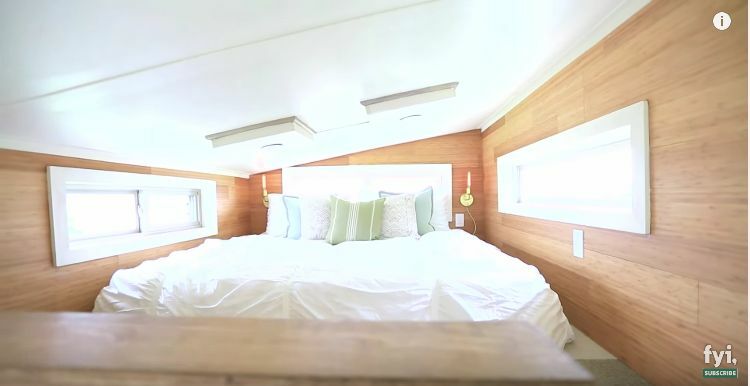 The home has its roots in celebrity, anyway, as it was originally built on Tiny House Nation -- Season 1, Episode 4. That means, it was born (or built) in the public eye -- and to think, I knew it when it was just a wee shack wearing wainscoting for knickers. Now look at our prodigy; all grown up!